We have been working hard these 6 months to enhance our products. Apart from bug fixes we have added several new options. If you are interested in them hit download button. The new version will be installed and registered automatically. 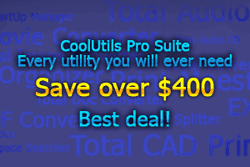 All CoolUtils Pro bundle users are entitled to all upgrades for free. Email us at [email protected] with any questions or concerns. New for all converters: now when you convert files to PDF you can add a digital signature. New Upgrades Policy! Please, note that our support policy has changed this year. CoolUtils Pro bundle owners get free upgrades for the last time. Since 2012 all registered users may purhcase 1 year of upgrades and tech support for 30% of the current product's price. Details. - supports new YouTube format. - allows to add the artist value when converting a cue file via command line. New - now has a new command line parameter to assign "Author" and "Creator" to a resulting document. New - Converts converts new YouTube videos. - allows setting exact pages that you want to print via command line. New - has a new interface with a preview panel. New - allows sorting emails by date and other fields. Combine DOC, XLS, HTML, RTF, PDF files into one PDF. Not in the Pro bundle. You can get it with 20% discount.